ISOS did the most amazing job converting a traditional farmyard to an original and magical wedding venue. 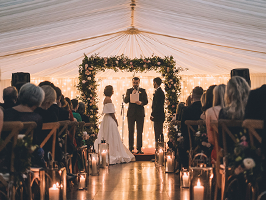 There was incredible attention to detail in erecting the marquee in a courtyard and attaching it to three buildings and dealing with the different floor levels. The advice we received in the planning stage was so valuable and everything including changes were documented and kept within budget. The staff were totally delightful and really worked to together as an efficient team. 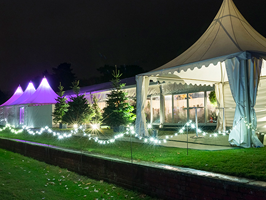 Inside Outside Marquee Hire provide the finest , Award Winning marquees in Surrey and the South East for weddings, parties, corporate events, themed events and winter or seasonal parties. 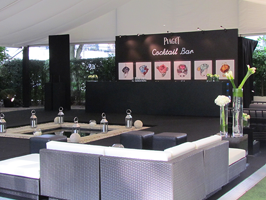 We are a family business with over 38 years of experience in delivering marquees fully equipped with power, sound, lighting, furniture, luxury loos, in fact, everything you could possibly need to ensure your event goes smoothly and exactly to plan. We have a reputation for providing a highly professional, seamless service. 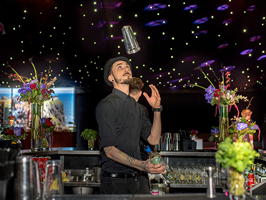 From planning to creation to the moment we arrive at your venue – we will take care of the details so you can relax and enjoy the party.